Despite an incredibly short recording career Joy Division remarkably have stood the test of time in terms of influential British bands. Their dark, brooding sound has inspired more artists than could be listed and their continued adoration today is testament to the forward thinking yet inward projected music and lyricism of a young band on the brink of success yet unsure of how to deal with it. With the sad passing of Ian Curtis, from the ashes rose New Order; the same core band but with a new fresh approach to their chosen career path. Loud, colourful and full of life. 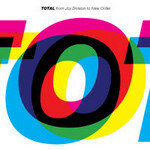 'Total' is a chronological look at the two bands most important tracks, covering Joy Division staples such as "Love Will Tear Us Apart" and the resonating "Atmosphere". New Order bring to the table "Blue Monday", "Bizarre Love Triangle" and "True Faith". Also included is a brand new never released New Order track "Hellbent".